Thank you: Karnataka Government; You are the best spoilsport. The fuss continues – to be or not to be open after 11pm. The excise laws in the state of Karnataka make F&B outlets comply with a silly ruling that was brought into effect a few years ago. Reason? Roadside robbery, Killings, Drunken Driving and other Law and Order issues! This is not just cynical but also stupid, one would wonder. But not our friendly Babus who sit at the Soudha. They believe that the best way to curb the above mentioned menaces would be to shut F&B outlets by 11pm. And it was the same Government that held a Global Investors Meet early June which attracted the likes of Lakshmi Mittal, Vijay Mallya and many other investors from across the country and the world who have committed (although only an LoI) to invest over INR 40,000 Crores in the state. 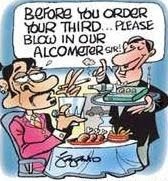 Bangalore is truly set to become a global city but the archaic laws would still prohibit dining after late hours! We are aiming for more BPOs, IT – ITES industries and knowledge workers who would work 24/7/365 and manage businesses but there wouldn’t be a place for them to unwind after work! Many would have read the recent controversy courted by the Commissioner of Police, the Minister of Excise and the media – initially a proposal which was later converted by the Minister as just a thought – that Five star hotels would be allowed to serve alcohol upto 1am. And those like me who can’t afford such places? – that’s not the government’s problem. Alcohol anyway is not good for oneself and the country! Cynicism apart, the larger issue here is not just keeping restaurants and bars open. It is about projecting the image of the city, its people, its society. I have had the privilege to visit many global cities such as Singapore, Hong Kong, Kuala Lumpur and Shanghai in Asia, Zurich, Frankfurt in Europe and many others. None of the cities shut shop at 11pm. Yes, most of the regular F&B points and Malls close around that time because their main clientèle, the families wind up by then. But for those who want to continue, there are enough and more places where they could visit. What I find silliest, if not funny is to connect Law and Order to closing F&B outlets by 11pm. 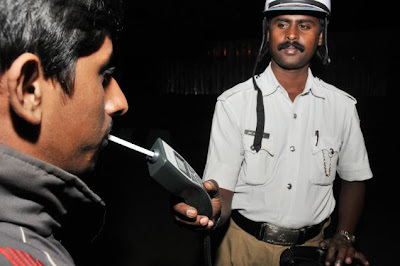 The main claim to fame by the city police is drunken driving. While I am always up and against drunken driving myself and have never done such an act for many years now, this cannot and should not be a reason for restaurants and bars to be closed. What we need is more vigilance, which is not something that the Police Dept is ready to provide. At last count, the manpower shortage in the dept. was as high as 30%. And whatever check that the police perform is restricted to weekends, between 10-11.30pm because that’s when most people get out of F&B places. I have always advocated that when a person is caught Drunk and driving, it’s not some basic fine but a steep one that would really work. I always wonder if people in the West or other countries are actually disciplined all by themselves, whether it is obeying traffic rules or other civic rules. Most often I have noticed that it is the fear of Fine, a form of punishment that deters people from committing such acts. In India, one can get away by paying a mere Rs. 100 for over-speeding, parking in an unassigned area or even jumping traffic signals! Shamefully, the basic fine for drunken driving is all of Rs. 1,000 / - . If the sergeant feels so, then he could summon the errant driver to appear in front of a metropolitan court and accept his mistake, pay a fine and then he / she is out. I am told that in some cities in Japan, the bar-man keeps an eye on those who consume more than the stipulated level of alcohol and while the bill is cleared, they are advised to either take a taxi or use one of the chauffeurs who are appointed by the night-club for a small cost. This way, many people get employment part-time and patrons are taken home safely. This is not just customer service but by law. Such an idea was mooted and tried by a few restaurants in the city, but for reasons one could guess, it just didn’t work. We preferred to drive back ourselves. Wonder what this curb means to F&B business across the city. If the outlets are kept open for 2-3 hours more, the sales could increase by 10-25% depending on the category. The increase in taxes alone one would pay off the additional costs (if any) to maintain law and order in the city. Recently, Delhi Government announced that small joints could sell Beer and Wine, keeping in mind the upcoming Commonwealth Games in Oct. 2010. We are not even asking to increase the number of Liquor points of sale, but just to extend the time until which places that serve F&B are kept open. Will the upcoming global city get truly global? Time will tell. Cheers. Low Cost: It’s all about perception! There is a famous saying doing the rounds in recent times: 19th Century globally was about roadways, 20th century was about railways and the 21st century is all about airways. How true! 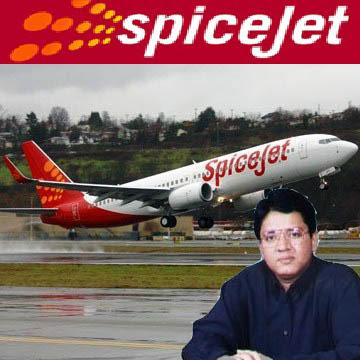 Mainline media was abuzz over the past weekend about the most recent development in Indian Aviation – Sun Network owner Kalanidhi Maran had purchased a strategic stake in his personal capacity in Spicejet (IATA Code: SG), the second largest low-cost airline in the country by market share. While the deal has been on the table for over 3-4 months, the timing couldn’t have been better. Passenger and Cargo traffic is at an all time high since late – 2008 after the global recession and the US sub-prime crisis. Major airports such as Delhi IGI, Mumbai CSIA and Bengaluru International Airport are squeezed for space and the check-in / security queues during peak hours could take as high as 30 minutes per person. Spicejet, apart from other low-cost airlines such as Indigo, Go Air, etc. have been in operation for around five years, ever since the first low-cost airline in India, Air Deccan was launched. It has carved a niche for itself with its on-time performance and crew service standards just like its main competitor, Indigo. Jet Airways, India’s premier airline and Kingfisher, the only five-star airline in the country, also have their respective low-cost avatars, Jet Konnect and Kingfisher Red respectively, which directly compete in the same price segment. So what’s with a media baron who is the leader in his own right in TV (Sun TV networks), Radio (S FM), DTH (Sun Direct) and many other related businesses got to do with Aviation? His critics slammed saying he lacks experience and exposure in the business to which he replied “CEO needs core competence; Chairman needs foresight”. Well said Mr. Maran. After all, he had purchased an entity which was operating in the low-cost segment. The concept of low-cost and low-fare have been misread in India for some time now. Air Deccan was actually low-cost and low-fare – the airline had minimal usage of resources (human and others) compared with many other scheduled airlines such as Air India and Jet Airways. The in-flight services were minimal and water for drinking was being sold – contrary to an almost Indian way-of-living “Athithi Devo Bhava” (Guests are treated like God). World over, low-cost airlines are the ones who are faring well even during the slowdown. That’s because their business model is like that. Scheduled airlines in India are competing on price but retain many other value-added services, which is what costs them and like how! A quick comparison between various airlines revealed that the fare difference on low-cost and scheduled airlines between Bangalore and Delhi if booked a week in advance is not more than Rs. 800/-. While Spicejet and Indigo offer the ticket at Rs. 5,476, Jetlite at Rs. 5,497/-, Jet Airways at Rs. 5,548/- and Air India at Rs. 6,210/-. There is a lot that can be compared between Aviation and Retail. Global experts on Macro-Economics say that for a buoyant economy, Aviation must grow twice the rate of the national GDP. That’s been the case in India since early 2000s, barring a few months of turbulence since mid-2008. The same applies for Retail. Both industries propel consumption and reflect growing consumerism and aspirational affordability; both bring in healthy competition and the uncompetitive are flushed out within a few years; both Industries grow only by scale – larger the number, higher the economies of scale. Both industries are a favourite for international players driving FDI into the country. Both provide direct and indirect employment for thousands of people (although aviation globally is reducing the number of staff per 1,000 pax, this number would continue to remain high in India due to localization issues). And both can work pretty much independently without Government support although policy decisions do affect the functioning of the industries. Organized Retail has been growing at over 15% CAGR for leading retailers ever since they came into foray during the last decade. 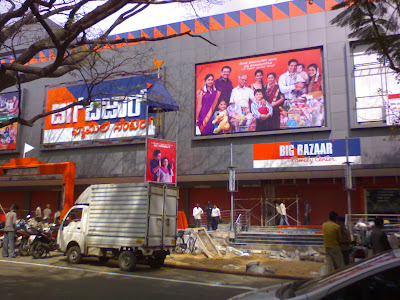 The highest growth has been for retailers nicknamed “Hypermarkets” led by Big Bazaar, a Future Group entity that commenced business in the year 2001 at a nondescript VIP Road, east of Calcutta. And the rest, as they say has been not just history, but historical! The group has managed to open over 140 outlets, over half of which were during the past 4 years. Other players in the same business include Hypercity (by the Rahejas), Star Bazaar (by the Tatas), Reliance Hyper, More (by the Birlas), Spar (by the Landmark Group of Dubai), Total (by the Jubilant Group), Easy Day (by the Bhartis) and many other local and regional players. The idea was simple – lease a big box location; project the business as low-cost, sell atleast 100 items at the lowest price possible and communicate the same en-masse. By attracting thousands of shoppers to visit the store, Retailers look to sell their products in large quantities thereby managing better economies of scale. The business would become profitable over a period of time, but only with more number of outlets selling more SKUs. Not all the items in a Hyper are always low-cost; At the end of it, it’s all about perception – of Low-Cost. 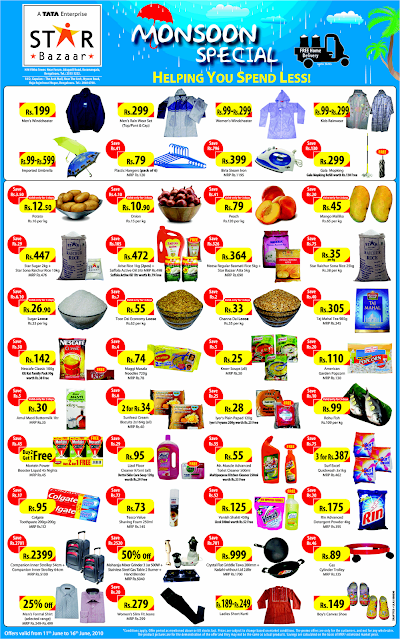 Hypers reinforce the fact that the key household items are below the selling price in the local markets; this acts as a bait to attract shoppers to visit the store. Over a period of time, consumers get hooked to the idea of shopping in a relaxed, convenient, hygienic environment where they could also save some money! So whether it is a Low-cost airline or a Hyper, its all about perception. And there are many who are trying it hard. Only some will succeed. After all, those who do so will have people at the helm with foresight. It surely helps. Many of you who read the “Mint” tabloid daily would have seen a surprise over the past few weeks. There is more advertising than ever, naturally since that is what most newspapers are all about. Thankfully, the columns from WSJ (with whom the newspaper has a strategic alliance in India) remain intact although in the last four pages of the paper. There is so much clutter, lots of entertainment, cinema and theatre, et al, what one wouldn’t usually find in a business newspaper such as this. My days are counted, how long I would subscribe to this daily! One of the first things (eye-catchy and hence this article) that one would notice is the first-page silo – in advertising parlance, one of the highest money-spinners. Usually located on the right-side bottom of the first page of the newspaper, the rates for this spot are among the highest, given that they receive enormous attention from readers and browsers alike. One would usually notice Luxury Products advertised here as this creates utmost attention in the mind of the reader. While I can’t comment on the history and origin of silo advertising in newspapers, this trend is followed worldwide and is not new in India either. During the upcoming wedding season in India, it is quite common to see many Watch Brands advertising to enthuse prospective brides and grooms (although the ratio of Women’s vs. Men’s advertisements would be 3:10). 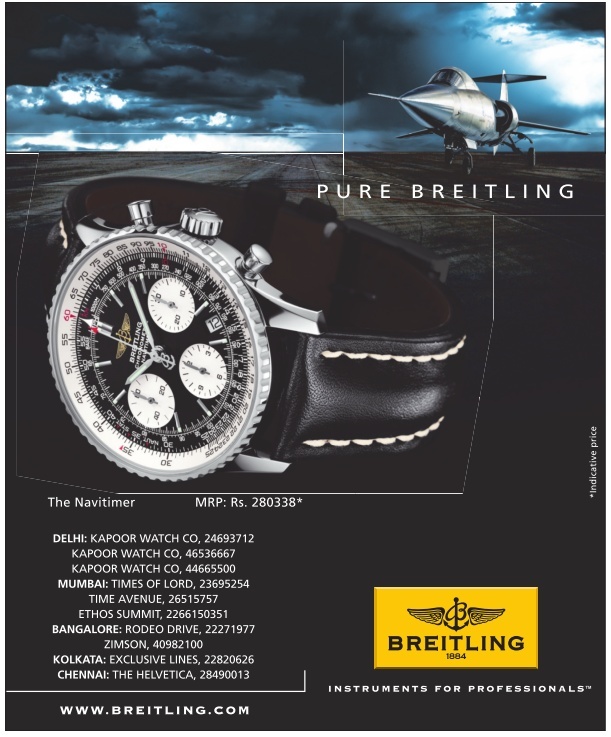 What was so catchy today was an advertisement for a wrist watch on Page One – Breitling, credited to be a Pilot’s watch and an aviation enthusiast’s prized possession, for its accuracy and perfection. While the watch itself is a bit intimidating, Big and Loud with so many features on the Dial and usually fits large wrists, it is indeed a trend that’s catching up in India too. Many brands are currently offering the non-traditional large dial that’s selling like hot cakes across models. Although Breitling doesn’t have a long list of celebrities who officially endorse the Brand, many of them like Brand Pitt have worn them in private occasions and even in movies. 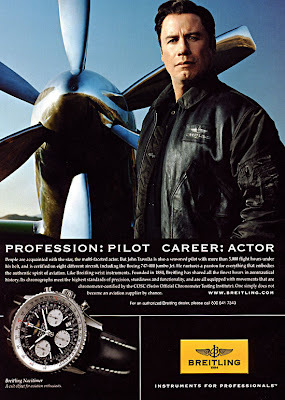 What was a bit strange for me is that the advertisement carried the Price of the Watch, quite a rarity in Luxury Brand Advertising. Most luxury brands, especially watches do not mention the price, unlike mass advertising by hypermarkets who mention the prices of the top 20 SKUs so consumers would walk into their stores. Popularly called as “Loss Leaders” these SKUs do not yield higher margins for the Retailers but they attract higher footfalls, usually in the range of 10-15% than usual and eventually converting more of them into consumers. 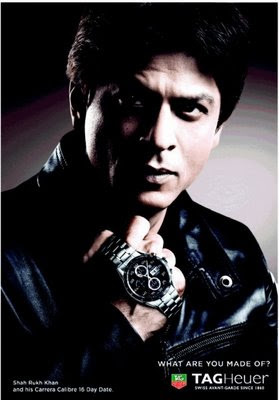 Many others who regularly advertise such as Tag Heuer and Omega only show a picture shot of the watch with their respective brand ambassadors thereby creating an emotional connect and high aspiration among prospective buyers. 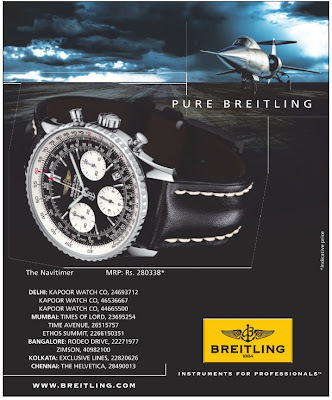 While it is common to list the name and contact numbers of Retailers who sell the watches, it was surprising rather strange to see one of the leading watch brands of the world mention their prices on a newspaper! These are ways suggested by some agencies to seek higher attention but by mentioning the price, not only they would be restricting the potential walk-ins into the store but would also be lowering the standards of the Brand. Hope this trend wouldn’t continue for long, lest we would see prices of Breitling and Cow Ghee both mentioned on the respective copies, one would restrict walk-ins and the other would improve. Retailer’s agencies - choose which one you want!